The rock-cut Achaemenian monument of Qadamgah was discovered in 1881 by HL Wells. 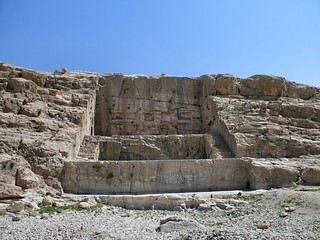 It is located about 50km South-East of Persepolis, at the southern extremity of the Kuh-e Rahmat mountain. 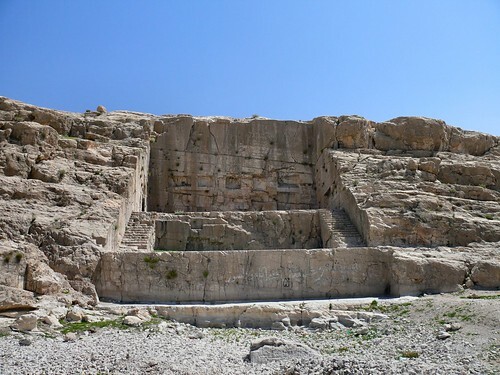 The monument is carved in the body of a rocky cliff and consist in the superposition of 3 rectangular platforms of equal width, approximately 20,10 m each. The inferior platform lay above a now dry pool which used to be flooded by a spring. Its depth is 2,5m. It can be accessed by climbing and walking over the rocky surfaces beside the monument, no evidence of any frontal access such as a stairway was ever found, although it doesn’t mean one never existed in the past. A rail carved at the bottom of the walls testifies of the former existence of a large pavement covering the whole surface of the floor, although curiously, no pieces or even fragments of such pavement has ever been found in the immediate vicinity of the monument. The superior platform has the bigger surface and dominates the 2 others. Its depth is 13 to 15m. Interestingly, the floor and the lateral and back walls all show several rectangular niches between 10 and 30 cm depth. Above and beside the monument, several holes can be seen cut in the rock, mortises were hoists pillars were inserted allowing to clear some heavy pieces of stones out of the site. If the style and the carving technique of the monument is clearly Achaemenian, its function remained unclear until recently study. Looking somehow about similar to the royal rock-cut tombs of Persepolis, a funeral function was at first evoked. Lacking decorating relieves, the tomb was then presented as being unfinished. The niches were for a time considered as possibly hosting bones. A technical study involving specialists of stone carving techniques and engineering made recently clear that the poor rock quality was not recent and existed at the time the monument was made. Such friable and crispy rock was then known to be incompatible with the realization of a royal tomb, all characteristics perfectly known from the Achaemenian era engineers. It also showed that the multiples niches seen on the walls were in fact hosting cut stones designated to repair the multiples imperfections of the rock. A cultural function is now let alone, backed by the fact the Kuh-e Rahmat was a holy mountain for the ancient Persian, the immediate proximity with a water pool & spring allows to think of a water cult dedicated monument.